We had heard that NoDo will make it’s way to the LG Quantum and Samsung Focus on April 19th and thankfully that has become a reality. Yes folks, the first software update is upon us. Fire up your Zune software (or Windows Phone Connector for Mac users) to install the update. NoDo will not be delivered to the HTC Surround, as confirmed earlier by Eric Hautala of Microsoft. This is due to additional testing necessary due to additional third party software packages on the Surround. The update offers a host improvements. Most notable being support for copy and paste. The Marketplace experience has also been refined. Prior to NoDo, searching in a particular category would bring results from music, apps, etc. If you search within apps, the results will be apps only. There are also some minor speed improvements. AT&T phones also receive WISPr protocol support, allowing your phone to auto switch to AT&T’s WiFi hotspots when available. Also included is support for the AT&T Address Book. Share your update experiences in our Windows Phone 7 forum. Try connecting to Zune. My Focus prompted me to update, but you might need to connect for it to see the update. My phone didn’t prompt me. I heard the update was coming and checked zune every 10 minutes. Connected Focus to Zune software to update. 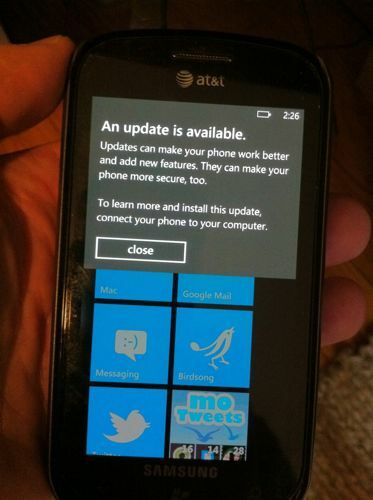 Mine says Windows Phone Update, February 2011. First, it went through a series of steps, up to 7 of 9. Then it rebooted, now it says STEP 1 OF 2: REBOOTING YOUR PHONE… It’s been stuck here for 40+ minutes. Any suggestions? Anyone? Help! That’s all normal. Check out our guide on how to update to NoDo. I got mine to update, although not without problems. I ran the windows phone support tool plus I had to do a hard reset and reformat the microSD card. Mine never got to the backup stage so I lost all pictures and files. Most apps disappeared, too. I notice a few improvements, notably copy and paste. One thing I’m really pleased with is, it seems the bluetooth connection is better. I thought I read somewhere about this being improved and I’m glad. I have a Jawbone Icon and it worked flawlessly on my old Fuze. When I paired it with my Focus, pre-NoDo, it seemed to fade in and out. Now it’s much better. It wasn’t totally seamless, but I got it updated and its going good! Plugged it into Zune and it says it’s up to date. Windows Phone Connector still doesn’t find any updates. Even though my phone notified me updates are available. Maybe this will be fixed in the next day or so. Microsoft has started to send out the update. Because updates are typically delivered to customers in batches, it might take several weeks before you receive notice that an update is available for you.